Shane Pegram shows off his Falcon Recurve, along with some of his fine Taxidermy skills. 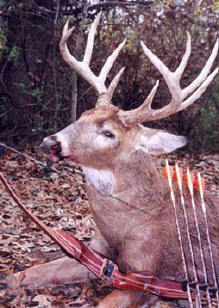 Daniel Sheffey Buck harvested with a 64" Hunter II, 54@31.5, 630gr of snuffer and chundoo arrow. Kevin Cummings and his Falcon Special with one less Deer Tag. Jose DeLeon and his Falcon Deluxe with his prize doe. 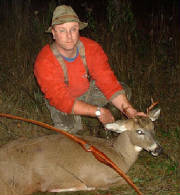 Mark James, Trophy Saskatchewan Buck taken with Crusader 54#@27", chundoo homemade arrows with 160gr snuffers on the sharp end. Mark James and son Dane, Crusader Trophy Saskatchewan Buck. Jim Ellis with his Chek-Mate Hunter II Take-Down & Trophy Pronghorn. 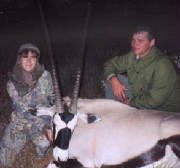 One of the Big Five - Gemsbok taken by Robin Vogel with her 47@26 take-down Crusader longbow. Africa Adventurer Robin Vogel with a nice Water Buck taken with her 47@26 take-down Crusader longbow. 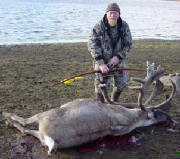 David Hamenstafer's Quebec caribou bull taken with Crusader Longbow. 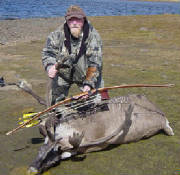 David Hamenstafer's Quebec second caribou bull taken with Crusader Longbow. 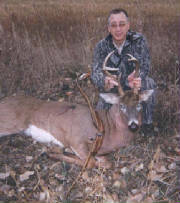 Doug Engel with his Chek-Mate Hunter II Iowa Buck Harvest. 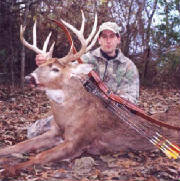 Doug Engel with his Chek-Mate Hunter II Wisconsin Trophy Buck Harvest. 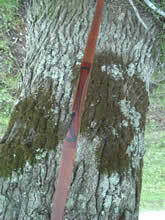 Kevin Cummings says any buck is a good buck especially with his traditional style CM Hunter II recurve. 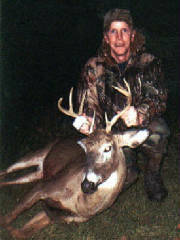 1st buck taken with a trusty Crusader. LBR and good friend Tom take in this great moment. Our own LBR scores this nice buck with his one and only Crusader. 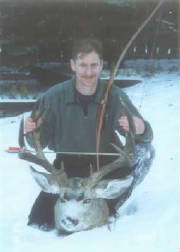 Rod Hamann with his Chek-Mate Firebird 53# @ 28" Trophy Buck Harvest. Rod Hamann proves onces again how reliable his Firebird 53# @ 28" really is. 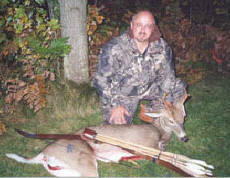 Ronnie Blackard with his 1st traditional deer using a Chek-Mate Hunter II Take-Down recurve. 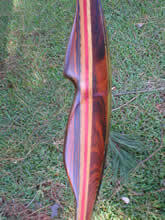 Steve Blackard ~ He's shooting a Hunter II. 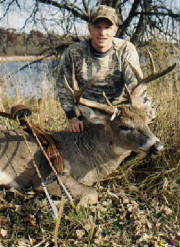 Branden McInteer - Nov 2005 using The King's Pawn at 64" in length, 55 # @ 29"
Dan, a close friend of Chad's, is proud of this deer. 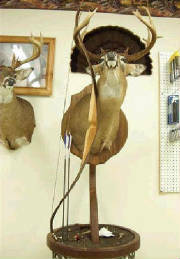 Ronnie Blackard's 5-point killed with his Takedown Hunter II. 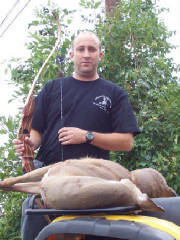 Scott Smith's buck with his Chek-Mate Crusader bow.